Click on the scenarios below to demo & play with the powerful features of AgendaX such as discovering where your team is at any given time or time frames. Fill in the form to enquire about our web based group calendaring for Outlook & Exchange solution. 1. How does AgendaX work? 2. What are the System Requirements for running AgendaX? 3. Do I need to install AgendaX directly on the Exchange Server? 4. Can I use AgendaX with my hosted Exchange provider? 5. How does the Agenda X service interface with an Exchange cluster server environment? 6. How easy is it to configure AgendaX? 7. How easy is it to tailor AgendaX? 8. How does AgendaX reflect calendar security in what it displays? 9. How are Groups created? 10. Can we book meetings via AgendaX? 11. If documents are attached in the calendar, are they pulled to the SQL database as well? 12. Can I use AgendaX to show calendars across separate Exchange organisations? 13. How is AgendaX Licenced? 14. What browsers are supported? 15. How scalable is AgendaX? 16. Does AgendaX cope with different time zones? 18. How does using AgendaX compare with using Outlook Calandar? AgendaX runs as a server-based Windows Service which reads appointments of selected users in regular intervals from the Microsoft Exchange Server Message Stores and writes the information into a central database (any kind of ODBC compliant database, e.g., Microsoft Access, SQL Server, SQL Express, MySQL, Oracle etc.). The calendar information is then published by Microsoft Internet Information Server (IIS) on the corporate Intranet or Internet site using a set of Active Server Pages accessed via a web browser. Access to any kind of ODBC compliant database, e.g., Microsoft Access, SQL Server, SQL Express, MySQL, Oracle etc.). Although AgendaX can be installed on the same server as Exchange, we recommend you install it on an existing Microsoft IIS Server with 2 GB of RAM, a Dual Core CPU, and with SQL (Express). Microsoft Exchange Online (Office 365), hosted Exchange. No, AgendaX can be installed on an IIS server; it does not need to be installed on the Exchange Server. No component installation is needed on the Exchange Server. Yes, AgendaX can be installed on a server at your Exchange provider, or installed on your local network, for example, if you are using Microsoft Office 365. If you install AgendaX on your local network you will need to install Outlook 2007 SP2 or later on the AgendaX server. As AgendaX is working like an Outlook Client, there is nothing to worry about in a cluster environment. If a cluster member fails, as soon as the other cluster member takes over, it will pick up from this one. AgendaX provides a web-based configuration console that enables easy set-up of all AgendaX features. A series of features (such as daily, weekly, monthly, quarterly views) are pre-configured and the majority of options are configured via forms. AgendaX ships with a series of icons to represent key functions, as well as background colours, date layouts, ruler colours, etc. It is very easy to change all of these elements, adding your own logo and background tile images as required. You can also tailor how meetings are shown, for example: Only show weekdays, only show meetings within normal working hours, hide meetings that are still at tentative status, display the meeting organiser in a ‘tooltip’, display the meeting attendees in a tooltip, etc. AgendaX offers 3 levels of security: No security, minimal security, and full security. No security - Everybody sees all calendars, but by default, AgendaX does not publish meetings with sensitivity set to ‘Personal’, ‘Private’, or ‘Confidential’. Minimal security - Details such as the subject and location are not published for certain users. Full security - Users will only see calendars of users that have granted them access rights to their Outlook calendar folder, with the option to display just free/busy data for calendars without permissions. You can also setup different installations of AgendaX to show separate groups of users if they are not allowed to see each other’s data. 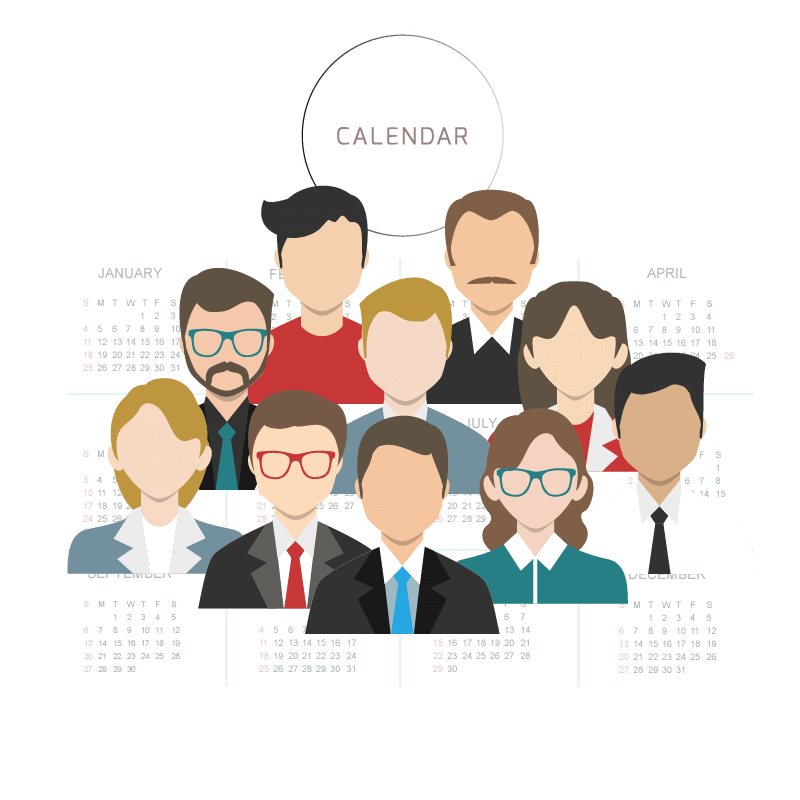 Calendar views that show different groups of people and/or resources can be created by the administrator or by end users. The administrator can configure an unlimited number of individual groups that consist of Exchange distribution lists and individual users. The members of these groups are the users whose calendars will be displayed by the AgendaX web application. Each AgendaX end user has the ability to define up to 9 personal groups that are only available to him/her. Personal groups are defined in the AgendaX web interface. Yes. If configured, all or selected users can make bookings via AgendaX without having to go back into Outlook calendar. Default booking templates can be created if required that pre-fill start/end times, subjects, categories, All day event = no, etc, making it quicker and easier for end users to complete their booking. If configured as an option, all or selected users can modify meetings. Note that all bookings are automatically synchronised into Outlook calendar and a log of all bookings made via AgendaX is kept. No, only the standard fields of appointments (like from, to, subject, etc. and any specified user properties are fetched from the Exchange Server and written to the database). AgendaX can also read specified attributes from Active Directory, such as telephone numbers to display via AgendaX. Yes. There are several ways to connect different AgendaX sites that don’t share the same Active directory forest, domain, or even if they are totally separate companies. For example, AgendaX can scan the mailbox calendars on local Exchange Server(s) and write the information to a locally held database. A datasource is configured between all sites (a specific port can be chosen) in order that all AgendaX installations are aware of each other. In this way, local calendar information will be pulled locally, but any request for calendar information from a remote site will be pulled on the fly as required in order to minimise network traffic. You can also configure calendar sharing around a single, central database. AgendaX can be configured to use different security models based on your requirement (see response toQ7). AgendaX is licensed according to the maximum number of mailboxes that AgendaX will scan, not the maximum number of users that will view the mailboxes. So for example, if you have 10 meeting rooms that you want to make visible via AgendaX, you will need 10 user licences. Note that the minimum number of licences you can purchase is 10. Note that the AgendaX server is not a separately licensed element, so you can install it on additional servers as needed. All major browsers are supported including IE, Netscape, Chrome, Firefox, Safari. AgendaX can also be viewed through the standard browser on mobile devices. AgendaX is easily configured to support large-scale, distributed environments. Multiple AgendaX servers can be deployed (e.g. in each major region or country), where each server stores in its database calendar data belonging to local users together with a list of all users and where their data can be found. For any requests that involve non-local users AgendaX opens up a connection to the appropriate databases to gather the information it needs to create the view. This means that as network traffic is kept to a minimum. AgendaX’ use of standard Microsoft technologies (SQL, IIS etc) means that scaling and indeed failover of any component is easily achieved in line with existing strategies. Yes. AgendaX allows users to set the time zone in which they are currently residing (bearing in mind this may change as staff move between locations). This allows all free/busy time to be displayed in the relevant time zone. Supported languages are currently English, German, French, Italian, Danish, Norwegian, Swedish, Dutch and Polish. Specified by the end user in your browser user settings (just like the timezone you’re currently in). AgendaX can include AD information and can therefore be used as a company directory.